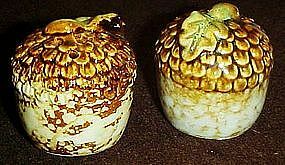 These vintage toby jug shakers have the red ink Japan stamp. They each measure just 2 1/4" tall. 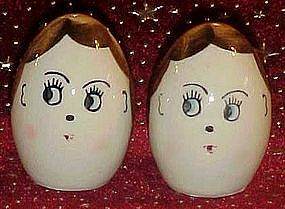 They are both in wonderful condition with no damages, Hand painted with nice detailing to the facial area. No corks. 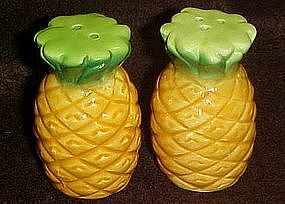 These were once probably a souvenir. 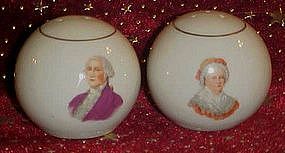 Each porcelain shaker has nice gold accent trim and Martha Washington is on one and George is on the other. 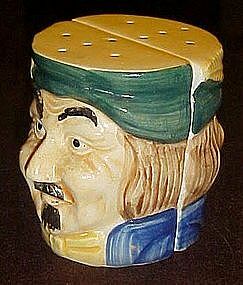 MEasures 2" tall and are in wonderful condition. Corks have been missing many years ago. 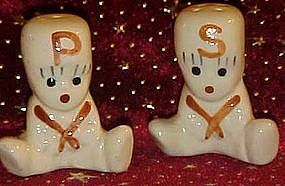 These cute solid glazed ceramic shakers are either Asian girls or little eskimo girls. hard to say, my friend and I have different opinions of their nationality! 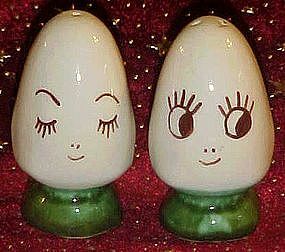 anyway... they are truely sweet and the tallest measures 3 1/4" tall. Great condition with no damages. There are no stoppers. 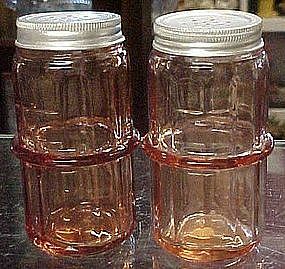 These look like Shawnee but I"m not certain. None the less they are from the 30's and very cute. Hand painted under glaze. 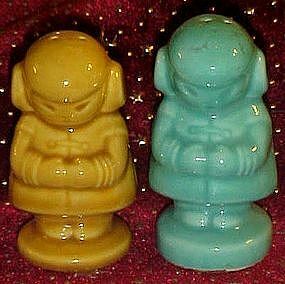 Measures just 2 1/2" tall and no chips or cracks. 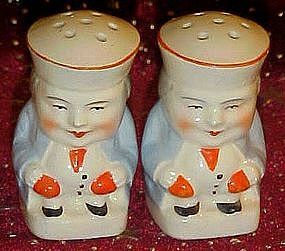 They look like little bakers, or sailors, maybe chefs. Perfect but no corks. Huge old teapot made by Porcelier, vitreous china USA. Big and heavy. Measures just over 8" tall. Excellent condition other than a small faint hairline crack that is 1" long on the lid. Does not affect it in any way. 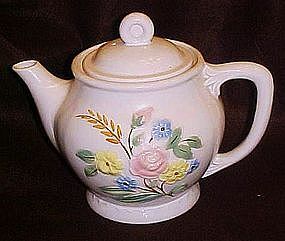 This is a wonderful teapot from the 30's. It has a steam hole in the lid. Please send zip when inquiring, it is very heavy! 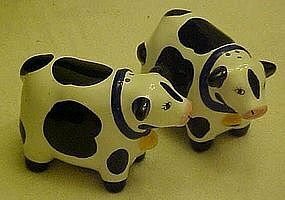 Adorable black and white cow shakers made by Coco Dowley, Certified International. 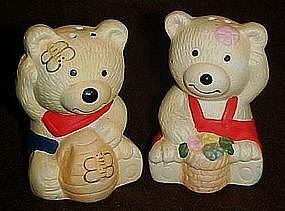 Measures 2 1/2" tall and are in perfect condition. Each cow wears a bell. Made of hand painted glazed ceramic. Not sure of the age, but think it is a reproduction. The cobalt blue toothpick holder has 2 panels of Betsy Ross with the flag, alternating with the daisy and button pattern. In one of the buttons is a J trademark. Measures 2 1/2" tall and has a star bottom on the base. Perfect condition. 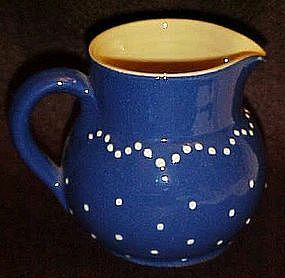 Check out this wonderful vintage, mint condition cream pitcher. 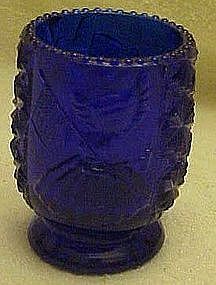 Heavy, pottery with a cobalt blue glaze. White polka dots relief decoration. Hand painted 11 marking on the bottom. Measures 3 1/2" tall and is in pristine condition. Would make a lovely gift . Just in time for the holidays.No need to shop around, we have 8 cookie cutters here for one price! Make sure you have all the cute shapes so you can make all those fun holiday cookie baking memories with the kiddies. 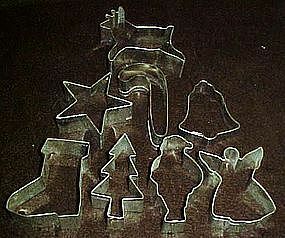 Nice tin cookie cutter shapes of a reindeer, bell, boot, Santa, angel, star, Christmas tree and a candy cane. All are in great condition as you can see in the photo. This great salad serving set may be made by Johnson Brothers to match their fruit sampler dishware. It is a perfect match. Wood fork and spoon have glazed ceramic handles with a pear on each. Measures 10 1/2" long and appear to never have been used. Pristine like new condition. Cute litttle bears have got themselves into a fix! One has a bee hive and is trying to get the honey as the bees come out. The other has a basket of flowers, that the bees will soon notice. Made of unglazed, hand painted bisque porcelain. Original stoppers, and have never been used. Made in China. Measures 3 1/4" tall. Perfect condition. 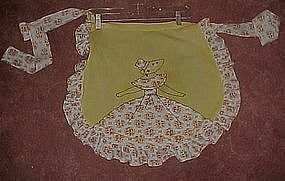 Adorable vintage apron with a plantation girl pattern. Embroidery accents. Nice condition, no rips, mends stains or holes. Pretty yellow calico dress and trim. These are not old ones, but a reproduction of those from days gone by. Nice large size measuring 4 3/8" tall. Heavy pink glass with panel design and aluminum tops. Excellent condition.